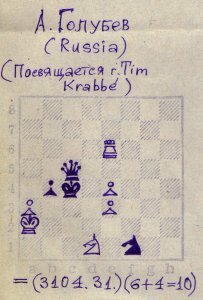 These days, chess is all computers and FEN and PGN and stuff, or something that is done by boring old people using dusty old pieces on an old piece of wood, but since I picked up correspondence chess, I sometimes feel the need to ponder chess diagrams. And since I’m a low-tech geek with a hipster-PDA and all, I want them on paper. Some grandmasters create exquisite works of art. I found some beautiful examples on Tim Krabbé’s site, but for myself, I wanted something simpler. So this is what I came up with: a very simple chess diagram using my own representation of the pieces. 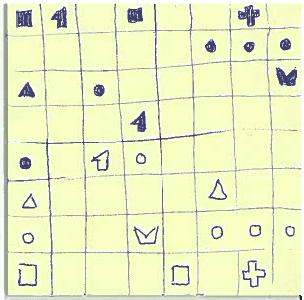 And using a square sticky to draw them on makes creating the board very easy: divide in two until you have eight columns, divide in two until you have eight rows. The pieces are quick to draw and easy to color, and I find them distinct enough so that I can think about the position. So I hereby release the SDN (Simple Diagram Notation or Sticky Diagram Notation) to the public. Share and enjoy. Now why are knights in chess diagrams always facing left? 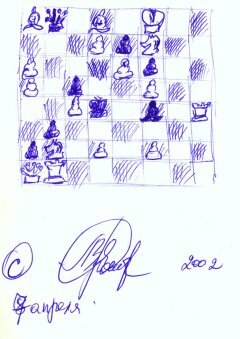 This entry was posted in chess and tagged chess, diagram, hand-drawn, hipster, SDN, stickies on 11/04/2011 by Dion Nicolaas.